This is a list of glitches in the game Super Mario Bros.: The Lost Levels. Note that most glitches found in Super Mario Bros. also appear in this game, with a few exceptions that only work on specific levels, such as the Minus World. This works in all versions, as well as the SNES and arcade version of Super Mario Bros. In any castle level, if an axe is touched while the timer is at 0, it will loop to 999 and award the player 50,000 points. However in the non-castle levels, if a flagpole is touched while the timer is at 0, no points are awarded at all. It is unknown how this is caused; most likely due to programming errors or sprite limitation. For example too many sprites on screen can cause graphical errors to the character or environment, but does not massively affect gameplay. In the middle of World B-3, there are two adjacent Brick Blocks, each with a coin above it. Normally, the right Brick Block contains a Power-Up. However, if the player does not collect the coin above the block first, then the power-up will not appear and the Brick Block will simply turn into an unbreakable block. In World C-3, there is one springboard in the middle of the level (which is necessary to beat the level) which will not appear if Lakitu is on the screen. To work around this glitch, Lakitu must be defeated before reaching this spot. In World D-2, sometimes the springboard at the very end of the level will not appear. This typically happens if the last red Paratroopa (to the right of the high row of brick blocks) is jumped on (which causes it to move to the right, towards the springboard). These glitches were fixed in the Super Mario All-Stars version. This only works in the classic version. In World 4-2 near the second Hammer Bro, there is a corner. The player must shoot a fire ball there and it will, with a one in ten chance, go through the corner. In World 4-2, the player needs to be near the end of the level until they go to two blocks. The player needs to jump from the blocks and move right. If done correctly, they will be on the other side of the Goal Pole. This glitch works in all versions. When encountering aggressive Hammer Bros. (i.e. the ones that run left towards Mario or Luigi), it is possible to be immune to their hammers. All the player has to do is stand on the left edge of the screen, and the hammers will not hurt Mario or Luigi. This greatly facilitates defeating them. In A-1, if Mario goes down the high pipe near the end as a Hammer Bro is throwing a hammer at it, the hammer can sometimes hit him through the pipe, causing him to take damage and slide out of the pipe sideways. There is another way to do an infinite 1-Up trick in World 1-1. It requires Small Mario or Luigi to do this. In World 1-1, there is a staircase next to a row of bricks along with a green Koopa Troopa. When Mario jumps on the Koopa, he should hit a Brick Block, kick the shell and as he stomps on the moving shell to make it stop, he will rapidly hit the same brick and it will give him enough time to keep hitting the shell, racking up points and extra lives. Similar to the World 3-1 shell trick in Super Mario Bros., there is one Mario and Luigi can pull off in the first level. The first Red Koopa Troopa the player will encounter is trapped in a box. The player must hit the second brick on the bottom to sprout a Super Mushroom, then bump it from below to pop it over the right wall and down to the ground. The player must run over and get it, making sure not to scroll the left side of the screen past the left wall of the box. Now that Mario is "super", the player must wait until the Red Koopa Troopa is next to the right wall, and break the third brick to trap him next to the wall. 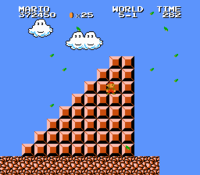 Then, the player need to go back and break the first brick, then jump up to the block that gave Mario a Mushroom. Smash the brick above Mario, and then the one next to it on the right, hopping onto the Red Koopa Troopa in the process. Mario will keep bouncing on its shell, racking up extra lives. The game won't let the player have two power-ups on the screen at the same time. Thus, they can make a Poison Mushroom disappear by sprouting a Super Mushroom. This glitch can be performed at any underwater level that contains corals above a pit (such as World 6-2). The player must swim to the right side of the coral, stop swimming for a moment and Mario will be stuck in the coral for a few seconds. If a Koopa Paratroopa bounces into a Warp Pipe or similar wall, it will be stuck there. The sprite of the Koopa rapidly goes left and right; therefore it looks extremely glitchy. This wasn't fixed in the SNES version. In levels where wind is blowing to the right, it is possible to walk through walls. One must touch the left side of any wall and repeatedly tap Left. Eventually Mario or Luigi will get sucked into the wall and slide to the right. Doing this on a pipe with a red Piranha Plant will sometimes kill Mario though, if the Piranha Plant is inside its pipe, which can be observed in World D-4. This glitch also works in the remake Super Mario All-Stars, and may also work in Super Mario Bros. Deluxe, but the player has to duck after being stuck and jump to get into the wall, due to the fact that there is no wind in the game. This page was last edited on March 17, 2019, at 23:29.